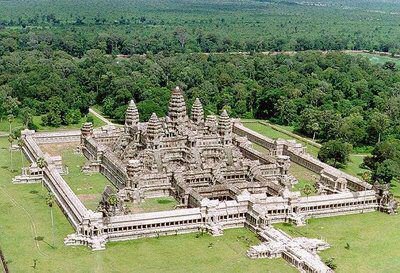 Angkor Wat (Khmer: អង្គរវត្ត or "Capital Temple") is a temple complex in Cambodia and the largest religious monument in the world. It was originally founded as a Hindu temple for the Khmer Empire, gradually transforming into a Buddhist temple toward the end of the 12th century. It was built by the Khmer King Suryavarman II in the early 12th century in Yaśodharapura (Khmer: យសោធរបុរៈ, present-day Angkor), the capital of the Khmer Empire, as his state temple and eventual mausoleum. Breaking from the Shaiva tradition of previous kings, Angkor Wat was instead dedicated to Vishnu. As the best-preserved temple at the site, it is the only one to have remained a significant religious center since its foundation. The temple is at the top of the high classical style of Khmer architecture. It has become a symbol of Cambodia, appearing on its national flag, and it is the country's prime attraction for visitors. The temple stands on a terrace raised higher than the city. It is made of three rectangular galleries rising to a central tower, each level higher than the last. Mannikka interprets these galleries as being dedicated to the king, Brahma, the moon, and Vishnu.Each gallery has a gopura at each of the points, and the two inner galleries each have towers at their corners, forming a quincunx with the central tower. Because the temple faces west, the features are all set back towards the east, leaving more space to be filled in each enclosure and gallery on the west side; for the same reason the west-facing steps are shallower than those on the other sides. On the eastern gallery is one of the most celebrated scenes, the Churning of the Sea of Milk, showing 92 asuras and 88 devas using the serpent Vasuki to churn the sea under Vishnu's direction (Mannikka counts only 91 asuras, and explains the asymmetrical numbers as representing the number of days from the winter solstice to the spring equinox, and from the equinox to the summer solstice). It is followed by Vishnu defeating asuras (a 16th-century addition). The northern gallery shows Krishna's victory over Bana (where according to Glaize, "The workmanship is at its worst"). and a battle between the Hindu gods and asuras. The north-west and south-west corner pavilions both feature much smaller-scale scenes, some unidentified but most from the Ramayana or the life of Krishna. Angkor Wat is decorated with depictions of apsaras and devata; there are more than 1,796 depictions of devata in the present research inventory. Angkor Wat architects employed small apsara images (30–40 cm) as decorative motifs on pillars and walls. They incorporated larger devata images (all full-body portraits measuring approximately 95–110 cm) more prominently at every level of the temple from the entry pavilion to the tops of the high towers. In 1927, Sappho Marchal published a study cataloging the remarkable diversity of their hair, headdresses, garments, stance, jewelry and decorative flowers, which Marchal concluded were based on actual practices of the Angkor period. The stones, as smooth as polished marble, were laid without mortar with very tight joints that are sometimes hard to find. The blocks were held together by mortise and tenon joints in some cases, while in others they used dovetails and gravity. The blocks were presumably put in place by a combination of elephants, coir ropes, pulleys and bamboo scaffolding. Henri Mouhot noted that most of the blocks had holes 2.5 cm in diameter and 3 cm deep, with more holes on the larger blocks. Some scholars have suggested that these were used to join them together with iron rods, but others claim they were used to hold temporary pegs to help manoeuvre them into place. The monument was made out of millions of tonnes of sandstone and it has a greater volume as well as mass than the Great Pyramid of Giza in Egypt. The Angkor Wat Temple consumes about 6 million to 10 million blocks of sandstone with an average weight of 1.5 tons each. In fact, the entire city of Angkor used up far greater amounts of stone than all the Egyptian pyramids combined, and occupied an area significantly greater than modern-day Paris. Moreover, unlike the Egyptian pyramids which use limestone quarried barely half a km away all the time, the entire city of Angkor was built with sandstone quarried 40 km (or more) away. This sandstone had to be transported from Mount Kulen, a quarry approximately 25 miles (40 km) to the northeast. The route has been suggested to span 35 kilometres (22 mi) along a canal towards Tonlé Sap lake, another 35 kilometres (22 mi) crossing the lake, and finally 15 kilometres (9.3 mi) upstream and against the current along Siem Reap River, making a total journey of 90 kilometres (56 mi). 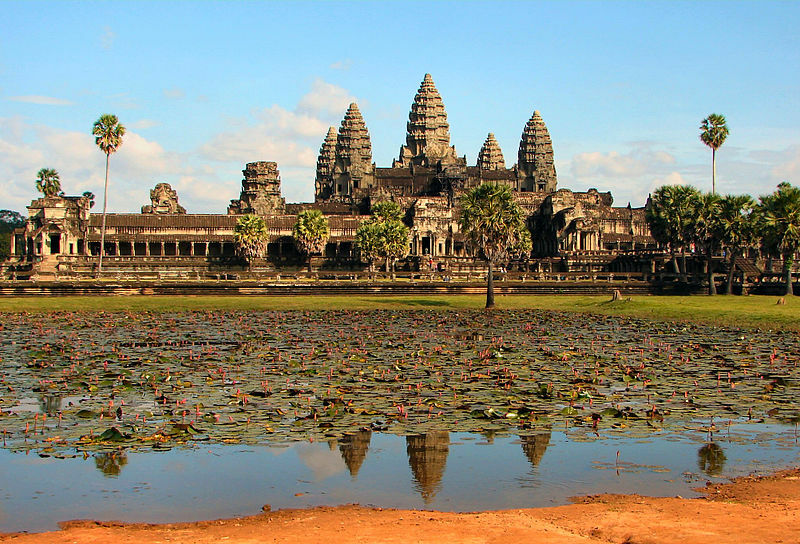 However, Etsuo Uchida and Ichita Shimoda of Waseda University in Tokyo, Japan have discovered in 2012 a shorter 35-kilometre (22 mi) canal connecting Mount Kulen and Angkor Wat using satellite imagery. The two believe that the Khmer used this route instead. Virtually all of its surfaces, columns, lintels even roofs are carved. There are miles of reliefs illustrating scenes from Indian literature including unicorns, griffins, winged dragons pulling chariots as well as warriors following an elephant-mounted leader and celestial dancing girls with elaborate hair styles. The gallery wall alone is decorated with almost 1,000 square metres of bas reliefs. Holes on some of the Angkor walls indicate that they may have been decorated with bronze sheets. These were highly prized in ancient times and were a prime target for robbers. While excavating Khajuraho, Alex Evans, a stonemason and sculptor, recreated a stone sculpture under 4 feet (1.2 m), this took about 60 days to carve. Roger Hopkins and Mark Lehner also conducted experiments to quarry limestone which took 12 quarrymen 22 days to quarry about 400 tons of stone. The labor force to quarry, transport, carve and install so much sandstone must have run into the thousands including many highly skilled artisans. The skills required to carve these sculptures were developed hundreds of years earlier, as demonstrated by some artifacts that have been dated to the seventh century, before the Khmer came to power. The restoration of Angkor Wat in the modern era began with the establishment of Conservation d'Angkor by École Française d’Extrême-Orient (EFEO) in 1908, prior to that activities at the site were primarily concerned with exploration. The Conservation d'Angkor was responsible for the research, conservation, and restoration activities carried out at Angkor until the early 1970s, and a major restoration of Angkor was undertaken in the 1960s. However, work on Angkor was abandoned during the Khmer Rouge era. Between 1986 and 1992, the Archaeological Survey of India carried out restoration work on the temple, although criticisms were raised about the damage to stone surface caused by their use of chemicals. Microbial biofilms have been found degrading sandstone at Angkor Wat, Preah Khan, and the Bayon and West Prasat in Angkor. The dehydration and radiation resistant filamentous cyanobacteria can produce organic acids that degrade the stone. A dark filamentous fungus was found in internal and external Preah Khan samples, while the alga Trentepohlia was found only in samples taken from external, pink-stained stone at Preah Khan. Replicas were also made to replaced some of the lost or damaged sculptures. Since the 1990s, Angkor Wat has become a major tourist destination. In 1993, there were only 7,650 visitors to the site; by 2004, government figures show that 561,0000 foreign visitors had arrived in Siem Reap province that year, approximately 50% of all foreign tourists in Cambodia. The number reached over a million in 2007, and over two million by 2012. Most visited the Angkor Wat, which received over two million foreign tourists in 2013. The site has been managed by the private SOKIMEX group since 1990, which rented it from the Cambodian government. The influx of tourists has so far caused relatively little damage, other than some graffiti; ropes and wooden steps have been introduced to protect the bas-reliefs and floors, respectively. Tourism has also provided some additional funds for maintenance—as of 2000 approximately 28% of ticket revenues across the whole Angkor site was spent on the temples—although most work is carried out by foreign government-sponsored teams rather than by the Cambodian authorities. The prospect of developing such large tourist accommodations has encountered concerns from both APSARA and the ICC, claiming that previous tourism developments in the area have neglected construction regulations and more of these projects have the potential to damage landscape features. Also, the large scale of these projects have begun to threaten the quality of the nearby town's water, sewage, and electricity systems. It has been noted that such high frequency of tourism and growing demand for quality accommodations in the area, such as the development of a large highway, has had a direct effect on the underground water table, subsequently straining the structural stability of the temples at Angkor Wat. Locals of Siem Reap have also voiced concern over that the charm and atmosphere of their town have been compromised in order to entertain tourism. Since this local atmosphere is the key component to projects like Angkor Tourist City, local officials continue to discuss how to successfully incorporate future tourism without sacrificing local values and culture.